A new swimming robot will help operators of power transformers by carrying out inspections without putting technicians at risk of manual entry. 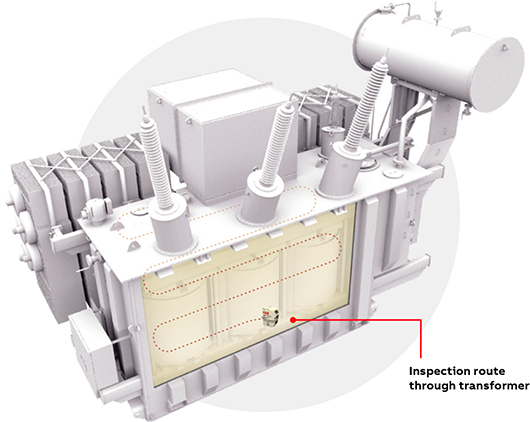 As high-value and critical assets, it’s important to know the condition of power transformers. Unplanned outages can have a huge impact on availability of power and reputation. Because many transformers are more than three decades old, they have experienced a lot of wear and tear. Over the years, overvoltages and short circuits can damage tap changers, windings, insulation, gaskets and seals. Recent changes to the power grid means that transformers are now experiencing load conditions they were not designed for. Therefore, it’s more important than ever to carry out inspections. ABB’s TXplore swimming robot can capture high quality photos and video from inside transformers. The robot is a little smaller than a football and has smooth, rounded surfaces and wireless control and data connectivity to avoid getting snagged. 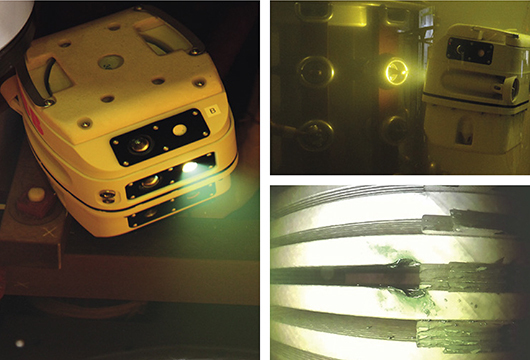 Bright on-board lights ensure that the robot will capture clear photography, even when age has darkened the oil. This compares with the traditional manual way to carry out transformer inspections. This requires draining and storing oil before sending in a technician into the interior. potential for oil spills and damage to the environment. This article was extracted form the ABB website. See below link to full video.